Das Urban Hub „DieNachwachsendeStadt“ ist eine Veranstaltung des Netzwerkes „dieNachwachsendeStadt“ und Arup. Das DieNachwachsendeStadt HUB beschäftigt sich über verschiedene Veranstaltungen mit den Kernthemen des Netzwerkes und den Verankerungen in der Stadt. Architecture surrounds us all, yet at the same time discussions surrounding architectural and urban development processes are often conducted at a distance from the end user in spaces not conducive to inclusive dialogue between all actors. However, if architecture is not actively communicated and developed together with the end user, it becomes difficult for us to forge identity with our built environment. The event is concerned with the question of how participatory, integral development processes can change and improve architecture, thus making it more sustainable. The theme will be explored in short impulse presentations with a fishbowl-discussion: how can we compare participatory approaches in rural and urban areas of Europe? How does participation work in developing countries? How can we create understanding and identification „from the bottom“? Architektur umgibt uns alle, gleichzeitig entfremden sich architektonische und städtebauliche Entwicklungsprozesse oftmals vom späteren Nutzer und finden in fachlich abgrenzten Räumen statt. Doch wenn Architektur nicht aktiv kommuniziert und gemeinsam mit den späteren Nutzern entwickelt wird, findet Identifikation mit dem Gebauten erschwert statt. Die Veranstaltung geht der Frage nach, wie partizipatorische, integrale Entwicklungsprozesse Architektur verändern, verbessern und damit auch nachhaltiger machen können. Sie beleuchtet diese Fragen exemplarisch in kurzen Impulsvorträgen und einer Fishbowldiskussion: Woraus bestehen die Unterschiede bzw. was ist deckungsgleich bei partizipatorischen Ansätzen in ländlichen und urbanen Räumen Europas? Wie funktioniert Partizipation in Schwellenländern? Wie schafft man Verständnis und Identifikation "von unten"? The Event will be held in German, individual talks are held in English and will be marked in the program. 2:10pm Roland Gruber, Nonconform: "miteinander weiter denken"
2:25PM Prof. Eike Roswag-Klinge, ZRS Architekten Ingenieure / TU Berlin: "NBL DesigBuild - Collaboration with the Global South"
2:40pm Prof. Nanni Grau, Hütten und Paläste/Frank Schönert, Hütten und Paläste: "anpassungsfähige Strukturen"
2:55PM Pierre Rey, Stadt Wolfsburg: "stretching the comfort zone – was ist möglich, was machbar"
How do we develop a resource-positive urban vision, in short - how can we overcome our consumer society‘s dependence on fossil fuels. Over the course of a one day symposium with a diverse group of urban actors, we will discuss three main themes. The use of renewable resources such as timber and other natural building materials will play a crucial role on our journey towards a post-fossil society. Experts will discuss what is already possible with Urban Wood and what challenges the future holds. 2:00pm Jeroen Meissner Partner und Partner Architekten - Woodscraper Wolfsburg Hochhäuser nachwachsen lassen? After the discussion guest will have the opportunity to network while gathering with circular drinks from the Infozentrale at Vollgut, NBL Building Cycle. The Event will be held in German, individual talks are held in English and will be marked in the program. Panel 1 MATERIALS & BUILDINGS presents innovative materials and construction solutions that upgrade Buildings to material banks and thus allow the recycling and upcycling of components. It also discusses flexible architectural concepts that circular buildings are based on. Panel 2 CITY & SOCIETY addresses the circular principles and their role in urban planning and examines social, ecological and economic aspects. These include new residential and Business models which aim at flexible and thus more efficient use of space and services, which will change urban planning significantly. The event will be held in English. Admission is free of Charge. During the lunch break there will be an opportunity to buy sandwiches and/or snacks. 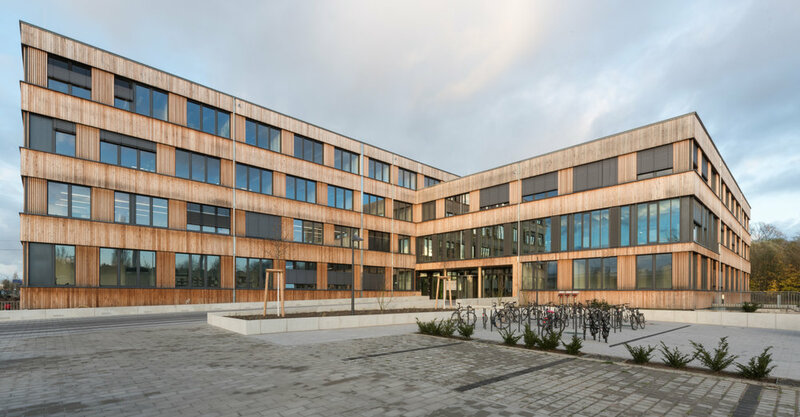 After the panel discussions you will have the opportunity to join a guided tour through the Building Cycle – a circular building made of waste materials on the VOLLGUT site designed and realized by students of the Natural Building Lab. The event will be held in English. Admission is free of charge. In times of change, planners, architects and engineers are required to develop new working methods suited for a society in flux. The borders between these professions must be overcome in order to develop integrative and transdisciplinary solutions. Working progressively with appropriate networks to find Solutions and root them in society offers enormous potential to achieve the necessary speed of change. Collective Knowledge production and self-determined learning are themes that can produce designers with the ability to affect long lasting change in our rapidly changing society. Tools for knowledge sharing and a focus on collaboration allows learners to critically challenge and design their own learning environment. Design is a shared resource that can be further transformed and developed as part of a diverse and transdisciplinary network leading us to Solutions not previously explored. At the Technische Universität Berlin and the University of Kassel, self-determined groups of students work in transdisciplinary teams on questions concerning the city and our built Environment. for a post-fossil post-consumer society. The Learners Lab provides a platform for the exchange of relevant content and above all the discussion and testing of self-determined learning formats. Info Hub realised as a DesignBuild project under circular construction principles using re-usable resources including used timber and cardboard boxes. Natural Building Lab at the TU Berllin. In co-operation with the research project RE4, a circular building from waste materials was realised, which offers an answer to questions relating to resource- positive construction in an urban context and embodies a new method of architectural production for a post-consumer society. The roof structure is formed from a pre-stressed grid of layered and interlocking re-used timber beams, while the wall Elements utilise a system of upcycled cardboard boxes and posters designed to last for at least one year. The InfoHub will be used by all of the diverse actors active on the VOLLGUT site in Berlin Neukölln, showcasing up to date information about the currently active processes and designs being developed for the site. The project should provide a place for actors from different groups to network with eachtoher and the neighbourhood, furthermore the site is a public place for encounter and discussion. It is hoped that this cross-polination will be a driver for new concepts and ideas for the site as a whole. During the festival the InfoHub will be permanently open and house an exhibtion about circular construction and the project’s development. users, etc. Knowledge is empowerment. Architecture is the result of building knowledge and building processes. Projects of the future need to be environmentally sensitive as well as socio-economically beneficial. In the current context of rapid urbanisation affordability of housing, not only in money terms, but also in terms of the environmental impact, is a growing concern. There is a tug of war between the environment and development, with spatial exclusion and social segregation emerging as universal phenomena, affecting even developed countries. Design helps to achieve more with significantly less: better use of ‘human’ resources (intelligence, knowledge, time) can prevent depletion and deterioration of other natural resources. The key to building an affordable future is surely education; and not only increasing access to formal education, but prioritizing lifestyle issues and consumption patterns. We have to learn to discriminate between the necessary and the superfluous, so that cities not only survive, but thrive. By now an innovative quarter will be developed at Holzmarkt in the centre of Berlin, fusing nature, culture and work. Cities need experiments in which new forms of working, living and co-existence, financing and participation can be tested on real property. As such, the Holzmarkt project is an architectural social and economic experiment and research object. The central planning concept for the village is the development of an architecturally practical, spatial structure that will serve ist users as a framework for new spaces of possibility. It is flexible and can be developed over the long term. By means of annexation, conversion and extension, it enables a constant process of transformation and so guarantees the preservation of creative freedom. Museum (2009) and the Museum in Rapperswil (2011). In 2016 :mlzd won the competion for the Tempelhof Tower (THF) and the project is currently entering the realisation phase. On 23.06 the site will be open to visitors as part of the Make City Festival. Kopfbau West will form the first publicly accessible part of the Tempelhof Airport building. The area of the Tempelhof Airport building should be opened to visitors by 2020 and barrier-free accessible. The aim of the project is allow visitors to experience the urban relationship between the airport and surrounding neighbourhoods. The re-organisation of the Kopfbau building is being undertaken in line with conservation guidelines and is a model project for the handling of an important piece of urban building culture within conservation requirements. The tour will take visitors over the roof of the hangars to Kopfbau West, where they will be able to view the exposed sturucture of the main staircase tower in Level 6. Die NWS ist die Bühne des Wandels zur post-fossilen Gesellschaft. Sie erzeugt die Energie für ihr Werden und Bestehen selbst, sie wird angetrieben von Sonnenlicht, Wind und Wasser. In ihr werden die ihr zur Verfügung stehenden, lokalen Quellen genutzt und mehr Energie produziert als verbraucht. Die NWS ist dicht bebaut und begrünt zugleich. Vielfältige Biotope erhöhen die Biodiversität und verbessern das Stadtklima. Stadtfarmen und vertikale Gärten tragen zur Nahrungsmittelproduktion, Ressourcen- und Energiegewinnung bei und bieten den Bewohnern darüber hinaus Raum für Erholung und Entspannung. Die NWS besteht aus robusten und veränderbaren Bauten, die sensibel auf räumliche, ökonomische und zeitliche Veränderungen reagieren können. Ihre Nutzer sind in der Lage, Gebäude ihren veränderten Anforderungen aktiv anzupassen oder zwischen verschiedenen Möglichkeiten zu wählen. Die NWS nutzt das bestehende Stadtgewebe weiter und wächst aus regenerativen und nachhaltigen Materialien wie Holz und Lehm. Baustoffe werden so eingesetzt, dass sie ein Vor- und Nachleben bzw. mehrfachen Nutzen haben. Darüber hinaus lassen Gebäude vielfältige Nutzungen zu, zur Ausbildung sozialer, ökonomischer und materieller, ressourcenpositiver Kreisläufe. In der NWS wird Gemeinwesen orientiert und prozesshaft geplant und gehandelt. Produkte werden immer mehr geteilt als besessen. Projekte werden aus Gruppen von bestehenden Bewohnern und Nutzern heraus entwickelt. Deren Besitz ist daher nicht Objekt der Spekulation, sondern dauerhaft und gemeinschaftlich organisiert. In der NWS gelten geringe, am Bedarf und nicht am Maximum orientierte technische Standards. Passive Techniken und nicht aufbereitete, gesunde Baustoffe kommen zum Einsatz. Klimasteuernde, bioaktive Materialien wie z.B. Lehm reduzierten die Gebäudetechnik, der ölbasierte Individualverkehr wird nicht mehr benötigt. Die NWS wird von vielen Köpfen gedacht und vielen Händen gebaut. In ihr werden die Themen der Stadt mit professionellen Akteuren in partizipativen Prozessen mit den Bewohnern vernetzt und umgesetzt. Denn nur neue Programme führen zu neuen Bauten. Das Netzwerk „die Nachwachsende Stadt - NWS“ wurde 2010 von einer Gruppe Berliner Architekten gegründet, deren gemeinsame Grundlage die langjährige Erfahrung des Bauens mit Holz ist. Auf dieser Basis widmet sie sich Fragestellungen von Wachstum, Nachverdichtung, Ressourcenverbrauch, Eigentumsverhältnissen, Teilhabe und Mitbestimmung der seit der Finanzkrise von 2008 boomenden Stadt Berlin. Ihre Mitglieder entwickeln seither in interdisziplinären Teams Modelle zum Wandel des Stadt-Organismus und setzen diese in modellhaften, konkreten Projekten um, deren Ziel es ist, eigenständige Standards gegen die rein profitgetriebene Immobilien-, Projektentwicklungs- und Baupraxis zu setzen. Die Nachwachsende Stadt ist eine Initiative von Architekten und Ingenieuren, die sich der ökologischen Weiterentwicklung der Stadt mit regenerativen Ressourcen verschrieben haben. Die beteiligten Büros arbeiten alle mit Holz und weiteren Naturbaustoffen und setzen diese in unterschiedlicher Weise in innovativen Projekten ein. Uns verbindet die Suche ach Lösungen auf dem Weg zu einer nachhaltigeren Gesellschaft die wir ganzheitlich im Dialog mit der Gesellschaft entwickeln. Neben innovativer Planung arbeiten wir an Forschungsvorhaben und sind in der Lehre tätig. Die Auswirkungen des Bauens bewerten wir mit aktuellen Zertifizierungssystemen und stellen so die positiven Wirklinien nachwachsender Ressourcen dar. Realisierung experimenteller Wohn- und Lebensformen im urbanen Kontext. Lösungen für Extreme Standorte und Bauaufgaben. Wir setzen uns für eine aktive Verbindung von Wohn- und umgebenden AußenraumGrünraum) ein: das Haus als offenes System, das im Austausch mit seiner Umwelt steht. Verwendung natürlicher Ressourcen. Minimalwohnen: Reduktion aufdas Wesentliche in Bezug auf Raumangebote, Technik, Konstruktion und Ressourcen: Einfaches Bauen - verstehbare Umwelt. Bauen mit Holz stand am Anfang. Und die Frage wasnachhaltiges Bauen für zukunftsfähige Architektur bedeuten kann. Bei komplexen Fragestellungen an die jeweiligen Bauaufgaben, stehen für uns einfacheLösungen dabei immer im Vordergrund. Technik soll natürliche Potentiale unterstützen aber nichtestimmen. Als Architekten, Energieberater und Cradlbe-to-Cradle zertifiziertes Büro, entwickeln wir gesunde, natürlicheund effektive Lösungen für intelligente Gebäude. Lehm, Holz und andere Naturbaustoffe ermöglichen diffusionsoffene Low- Tech Gebäude die als Niedrigstenergiegebäude oftmals mehr Energie über ihre Hülle gewinnen können als sie im Verlauf des Jahres brauchen. Als integrativ planendes Team ausArchitekten und Ingenieure planen, bewerten und zertifizieren wir Gebäude vorrangig aus Lehm, Holz, Bambus und weiteren Naturbaustoffen. In unserem bürointegrierten Labor betreiben wir Materialuntersuchungen und Baustoffentwicklungen. Die DACHFARM Berlin ist ein Unternehmen, das mit innovativen deutschen Forschungsprojekten und Firmen aus den Bereichen Wasserwirtschaft, Gewächshausbau, Energiemanagement und Architektur kooperiert, um das Potential ungenutzter Gebäude und Dachflächen zum professionellen Anbau von Nutzpflanzen und für partizipative Gemeinschaftsgärten nutzbar zu machen. Die DACHFARM Berlin berät, plant und baut individuelle und systemübergreifende DACHFARM- Systeme. Im Fokus stehen hierbei Wirtschaftlichkeit und Vernetzung der Stoff- und Energiereisläufe zwischen Gebäude und seiner Farm. pk architekten für energetisch-nachhaltige Gebäudekonzepte speziell qualifiziert. Planungsstudien Gasometer, Gewerbegebiet Naumannstraße, Schöneberger Linse. bildet das kontextuelle Bauen: im Bestand wie in schützenswerten städtebaulichen Strukturen. Wir schreiben Bestehendes fort und entwickeln weiter. bricht sie auf und macht sie öffentlich. Aufenthaltsqualität wird erzeugt, Kommunikation ermöglicht.